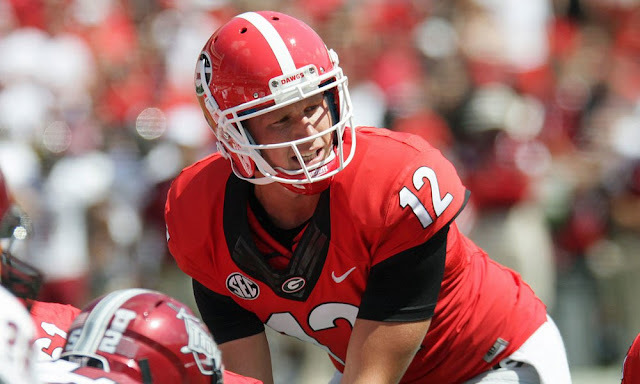 An Opinion On Sports: Brice Ramsey: Did You Get A Fair Shake? Brice Ramsey got a token appearance at quarterback for a couple of series in Georgia's TaxSlayer Bowl Saturday. He didn't get the opportunity to stay in the game and adjust to the flow of the game. He hasn't had that chance all season. We really didn't, and he didn't, get to see if Ramsey could play quarterback for Georgia or not. Faton Bauta got that opportunity for an entire game against Florida, but Ramsey never got even a complete half to prove himself. The Bulldawgs have struggled with a very inconsistent Greyson Lambert all year. Finding a game for Ramsey that he could call his should not have been a difficult task. Everyone knows UGA has the top high school quarterback in the country arriving in Athens next week in one Jacob Eason. Nevertheless, more than one capable signal caller will be needed. The totally new offensive coaching staff will probably give all the potential starters a clean slate to prove themselves. But what would be even better is to see the new staff develop the skills of these guys. This development was clearly lacking considerably this season.